Flowers & Lights: No decoration looks complete without flowers and light. The combination of lights and flowers looks stunning at the background of stage. 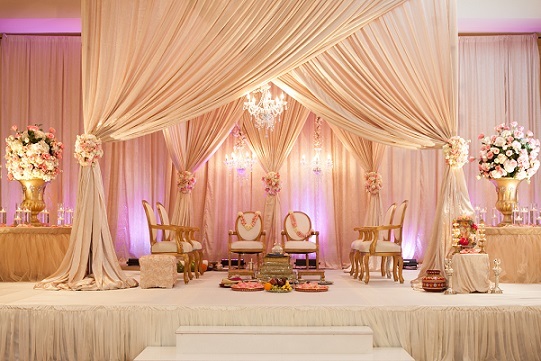 Satin Drapes : This style is perfect for any wedding . This type of decoration gives classy and elegant look to your wedding. You can choose the color as per your wedding theme. Royal Wedding : The color of gold gives royal look to your wedding. Create a classic center stage with artificial pillars of royal colors. This will also look great in your photographs. Pearly White : Pearly white decoration gives royal image to your wedding. It gives mystical and classy feeling. The decoration of flowers with pearly look gives sophisticated look. Red and Gold : Red is the color of love. Both color have a great importance in Indian wedding. A drape in gold and red gives royal feeling. "Boutique Floral designs for Weddings. Our creativity will bring your vision to life."